Showcasing a Celtic wedding cake design in your reception dessert is a wonderful way to take pride in your heritage and background. The Celtic knots are classic, beautiful symbols that tend to look very elegant on finished cakes of any style, and they're easy enough to do that you can make them yourself or have a professional decorator do it without going broke. 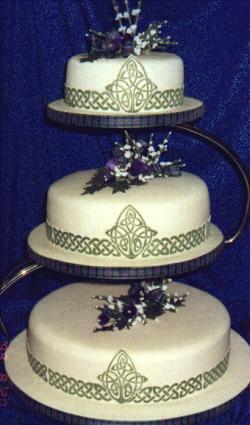 There are dozens of distinct Celtic wedding graphics to use as a pattern to adorn your cake. The most popular are knots, interlacing symbols that are often unbroken to indicate unity and continuity. A suitable option is a Celtic love knot, which most often depicts two winding, circular patterns that intertwine and lock together. A trinity knot is another popular design choice. It shows a continuous, winding triangle surrounding a circle and can have several symbolic interpretations, including the Holy Trinity, the three stages of a woman's live (wife, mother, and elderly woman), the three vows of a relationship (to love, protect, and honor), or the joining of mind, body, and spirit. 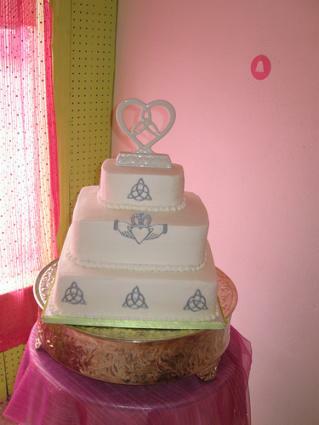 Celtic crosses, when piped on to an ivory cake with white royal icing or white buttercream, look intricate and elegant. Claddagh designs are another fun choice, especially if you have a Claddagh engagement or wedding ring. A simple way to pull off incorporating a Celtic design into your cake is to use a topper. 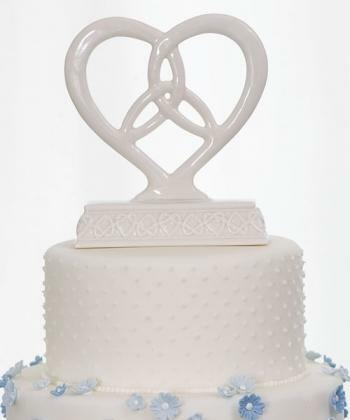 A white, ring-shaped Claddagh topper would look great if accented by red roses and set on a pale, ivory cake. Another classic white topper combines a heart with the trinity knot. A pewter heart topper is an attention-grabber, making it a fitting choice for plainly decorated cakes. 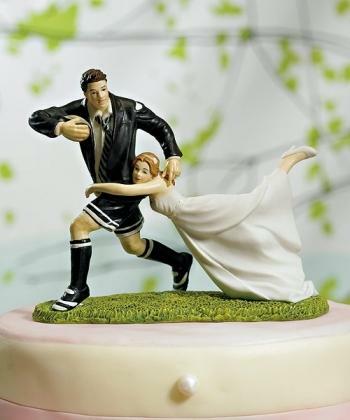 Celebrate your or your soon-to-be spouse's love of rugby with a comical, rugby-themed topper. CelticArt.com has a variety of Celtic toppers, ranging from a brass Claddagh design to a leprechaun couple and a ceramic Claddagh symbol. If you don't want all the show of a topper, though, there are much subtler ways you can illustrate Celtic designs on your cake. If you want to go to the traditional route and have a three-tier white cake with white buttercream or fondant, consider piping on a small series of knots with white buttercream and a small round frosting tip. For more contrast, use a pale green icing or flip the color scheme and decorate the cake with light green buttercream, piping white designs on it. If you or your decorator can find a Celtic stencil in the pattern you want, you may be able to create a continuous design all along the sides of each tier of your cake without spending much time at all. Before serving, show off your Celtic cake with a selection of fresh ivory and pale green flowers to accentuate its natural beauty and draw nature into the display.